Step 1. B.O.S.S.™ Always use N.O.G.C. (B.O.S.S. )™ FIRST! Clean up as much waste as possible then spray B.O.S.S.™ lightly over the affected area. If you have a stain, spray and blot with a damp cloth to remove the stain, then spray B.O.S.S.™ a few squirts at a time and scrub area with a damp cloth until stain is gone. NOT HARMFUL TO YOUR HANDS IN ANY WAY. This is an Example of equal part measurements 1-quart N.O.C.™ to 1 quart of water. In a new handheld sprayer. CAT PROBLEMS — 1 part of N.O.C.™ to 2 parts warm (not hot) water. DOG PROBLEMS — 1 part of N.O.C.™ to 5 parts warm (not hot) water. Thoroughly saturate the area (to reach the subfloor) extending about three times the size of the affected area. Let stand for 45 minutes to one hour.Then shampoo carpet with carpet cleaner as usual and be sure to rinse the area with extra water, then extract as much moisture as possible. Fans in the area always help to dry faster. 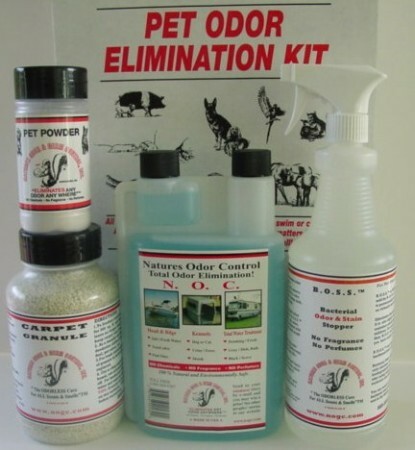 Pet Odor Elimination Kit contains 32 Oz of B.O.S.S., 32 Oz. of N O C, 32Oz. All-Purpose Granule and 8 Oz of N.O.G.C. All Natural Pet Powder.